Fall mums, with bokeh. Just in time for the long weekend. And let me just say . . . HOORAY for long weekends! Make it a good one, y’all. Hooray for you, anyway! Here in the hardscrabble Midwest we just nod in passing at poor Chris Columbus on our way to work, and swear when we realize the post office is closed. 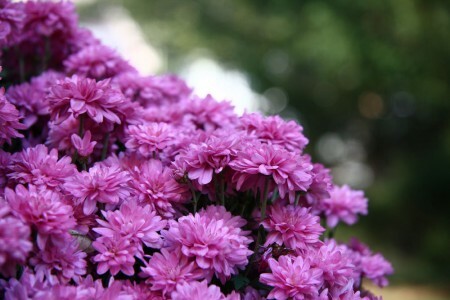 Pretty mums. Have a great weekend! Happy long weekend. Idaho ignores Columbus day. Maybe I’ll take a long weekend on principle. Very pretty. I had no idea it was a Holiday Monday. Photo trivia- before online photo lingo came up with “bokeh” , the defocused long lens plane was called “circles of confusion” . Don’t you love that? It’d be a good blog name, too. Pretty picture. Enjoy the long weekend! and fabulous photo as always! Have a grand long weekend!!! four days off – woot woot! Pretty! Have a great weekend – yay for three days off! I am taking Monday off, so I get a three day weekend, too! Very exciting. Have a great one! Have a gret weekend, thanks for sharing, I need to head to the nursery…..some flowers are callin’ me.